All of your hosptitality data in one spot. As travel is becoming more and more accessible, the hotel industry is growing to accommodate higher occupancy rates, and is changing to keep up pace with new entrants in the market (i.e. AirBnB). Whether you’re running a 5 star hotel chain or a simple Mom ‘n Pop Bed & Breakfast, you need to manage and monitor numerous aspects of your hotel at once to maintain successful business processes. Monitoring your various data on a dashboard helps you not only maintain your success, but also helps you reach new heights of success. Besides obvious financial aspects, the reputation among potential clients on the service and efficiency of an establishment can make or break a hotel. 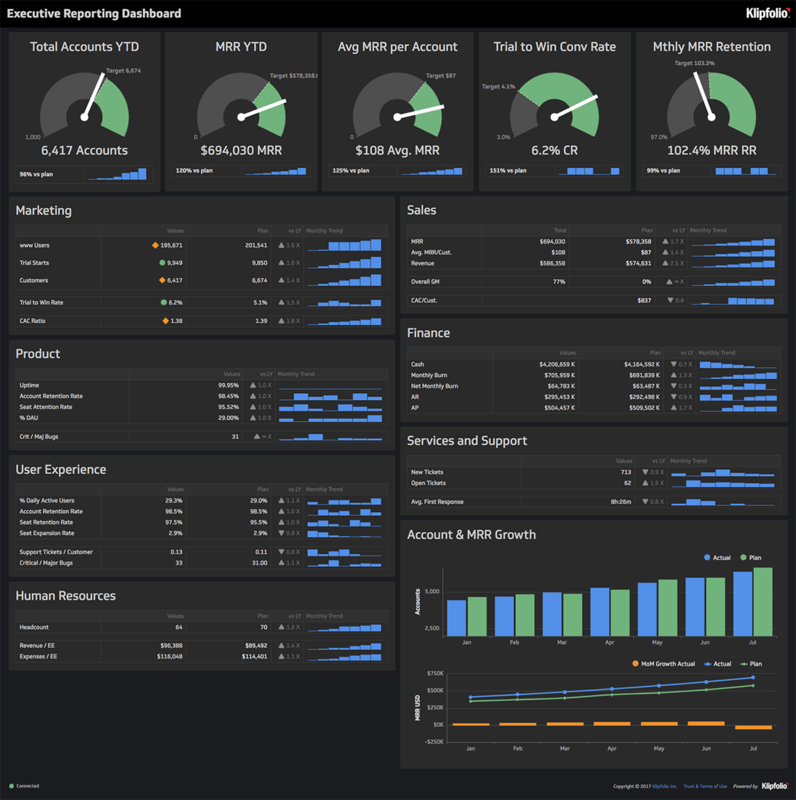 Klipfolio dashboards put all the data you need to monitor for success in every aspect of your hotel in one place, giving you a way to visualize your progress and compare it with industry standards and historical data. With real-time dashboards you can measure your occupancy rate, identify peak travel times, monitor your staff hours, keep an eye on the average length of time it takes to clean a single room, etc. all coming together to help you better run your hotel and give you more time to spend on making sure your clients’ time with you is the best it can be! Hotel dashboards don’t need to be focused solely on improving customer experience or service efficiency, though. Specific metrics can be used to zero in on important financial data, helping you stay within budget or to better prepare for an influx of actions which will require more resources. Curious to see what you can track in Klipfolio? Here are just a few examples of dashboards that can help you run your hotel or Bed and Breakfast. 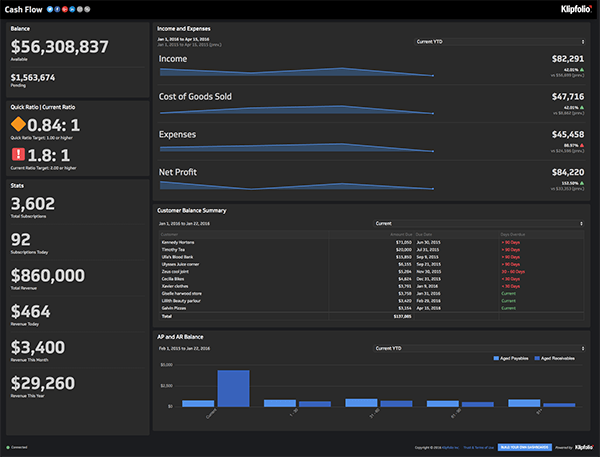 View the Live Dashboard examples to get a better look. Upcoming Reservations:A list of all approaching guest reservations for the day, week, month, etc. Klipfolio allows you to pull in data from all of the platforms you use to track your hotel data—and display precisely what you need in a single interactive dashboard. What does this mean for you? No more wasting precious time manually checking and rechecking reports with various versions of dynamic data. And you can get started with just a few clicks. Click here for a complete list of all our integrations.